Samosas are India's favorite tea time snacks or appetizer. A samosa is a triangular pastry filled with mildly spiced mixed vegetables or minced meat. It is served hot with sweet and spicy chutneys, i.e mango, tamrind, mint, or cilantro chutney. A Paratha is a flatbread that originated in the Indian subcontinent. A Paratha is usually made with whole-wheat flour, pan fried in ghee or cooking oil, and often stuffed with vegetables, especially boiled potatoes, or cauliflower. As of now you can buy Nisha's parathas which comes in three different flavours, i.e. Spinach Paratha, Potato Paratha and pumpkin paratha. Parathas can be eaten with curry, pickles or yogurt. Naan is a leavened flatbread from punjab India. Naan is made from wheat flour and baked in a tandoor (clay oven). 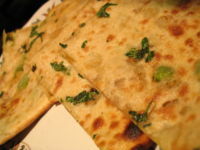 Naan is eaten with different curries or can be used as a pizza base. An unleavened flat bread made from atta (whole wheat) flour and water. Dough rolled out and baked on a tawa (griddle). Chutney is similar in consistency to jelly, salsa or relish, and is used as a sweet and sour condiment. Chutney is usually made fresh. It contains fruit and sugar to give it a sweet taste. Almost all chutney contains vinegar to give it a sour taste. The ingredients are mixed together and then simmered slowly. While chutney is primarily sweet and sour, there can also be many variations of spices, often giving it a hot and spicy flavor. This is a wonderful "comfort food" dish which is really very easy to make. 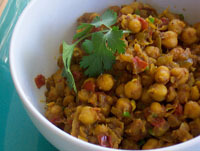 Chaana masala is spicy masala chickpeas and can be as mild or as hot as you like it. It is a classic North Indian vegetarian dish and is either eaten with rice or roti (chappati) as a main meal or is served as a side dish with a non-vegetarian dish. This is a very simple, quick and more importantly authentic Indian side dish of grilled eggplant and tomatoes and seasoned with cummin, turmeric, garlic, onions, ginger and salt. This is a traditional North Indian (Punjabi) dish. Serve with fresh rotis or naan. Um, it's soo good. Saag is a Spinach and Mustard leaves based curry dish eaten in India and Pakistan with bread such as rotis or naan. 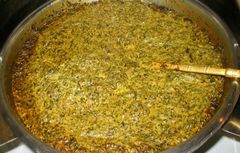 Saag can be made from Spinach, mustard leaves, and other greens, along with added spices and sometimes other ingredients. Saag paneer contains a type of cheese known as paneer. Saag is more common in Punjab where it is eaten with makki di roti. This roti is made of maize flour and is yellow in colour, though it can also be eaten with other breads. Nisha's also make saag chicken, where we replace paneer with boneless chicken cubes. Tikka Masala is a westernised Indian dish based on baked chicken chunks (chicken Tikka) cooked in a curry sauce. It has been hailed as "Britains true national dish" but is popular throughout the world. Chicken Tikka Masala is chicken tikka chunks of chicken marinated in spices and yogurt then baked in a tandoor oven, in a masala ('mixture of spices') sauce. "There is no standerd recipe for chicken tikka masala, a survey found that of 48 different recipes the only common ingredient was chicken". 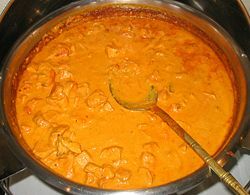 It is orange in colour and the sauce usually includes tomato and heavy cream and other different spices. You can also buy Nisha's Gram Masala, Chaana masala, Curry powder, dry lentils and other Indian spices right here at Nisha's. Nisha's CURRY PASTE, TANDOORI MARINATE, PICKLES, MEALS etc.